UNIVERSITY PARK, Pa. — Ten intercollege teams of enterprising students recently pitched ideas for innovative mobile health applications during Penn State’s mHealth Challenge. The challenge, which held its final round on Nov. 12 as part of Global Entrepreneurship Week Penn State, is a cross-college initiative in which student teams develop a mobile application prototype that addresses a societal health need associated with a specific target audience. Each team included students from the College of Information Sciences and Technology and at least one student from either the College of Nursing or the Department of Biobehavioral Health in the College of Health and Human Development. 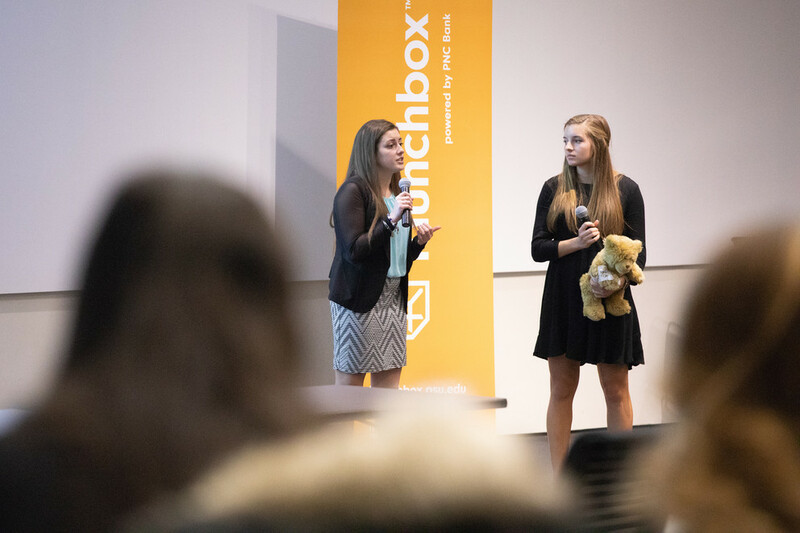 The idea from this year’s winning team was Pediatric Cub Companion, in which an app is used to control a Bluetooth speaker placed inside a stuffed bear to communicate with children about their medical treatment. The project was designed to reduce anxiety in pediatric cancer patients by providing comfort, knowledge and evidence-based coping mechanisms. The team included nursing students Amy Estes and Madison Ramsey, and IST students Jiahua Ma and Peter Meglis. “Nursing students are able to apply real-life problems that they encounter in their clinicals to the idea and the development of their apps, making it a valuable tool,” said Beth Cutezo, assistant teaching professor of nursing. In the challenge, undergraduate students who were enrolled in biobehavioral health and nursing classes — led by Joe Gyekis, associate teaching professor of biobehavioral health, and Cutezo, respectively — were charged with identifying the health issue they wanted to address and creating the supporting content. Then, they worked with IST student consultants enrolled in a “Technologies for Digital Entrepreneurs” class led by Megan Costello, assistant teaching professor of IST, to develop a mockup of the mobile app. The idea presented by the second-place team was My Mental Health, an app that serves as a resource for students who have been diagnosed with clinical depression and are transitioning to college. The app acts as a continuation of care by allowing the user to communicate with his or her trusted mental health professional who may be practicing in a different location. Team members included BBH student Meghan Field and IST students Brittany Chapin, Nicholas Menezes and Zeshen You. Third place went to Smart Smoke Alarm, led by nursing student Sydney Eckert and IST students Ying-Chu Chen, Peter Lehman and Morgan Sterling. The app allows a user to receive notifications to their smartphone from an internet-connected smoke alarm. When the alarm is activated, a user is alerted to call 911 and supply the rescuers with more detailed information from the camera on the alarm, such as if a family member is trapped in a room, so immediate action can be taken. The competition kicked off in late September when students formed teams and identified their health issue. Throughout October and early November, the teams participated in a series of workshops and coaching sessions — led by Meg Small of the Bennett Pierce Prevention Research Center and Lee Erickson of the Happy Valley LaunchBox powered by PNC Bank — to refine their solutions and practice their presentations. On Nov. 11, the ten teams pitched their ideas during a semi-final round to a panel of judges, who selected five teams to present their ideas in the final round to a panel of industry experts. Throughout the presentations, judges asked questions, shared advice on how to grow as professionals in their chosen fields, and provided encouragement for the students to continue pursuing their ideas. Semi-final judges included Mark Gagnon, Harbaugh Entrepreneurship Scholar and entrepreneurship coordinator in the College of Agricultural Sciences; Bryan Oxendale, information technology manager in the College of Nursing; and Kelly Wolgast, associate teaching professor and assistant dean for Online Education and Outreach in the College of Nursing. Final round judges included Emily Bjalme, clinical educator and student coordinator at Mount Nittany Health; Brian Harmon, Penn State class of 1983, an adviser and consultant for various cybersecurity startups; and Gregory Wolf, Penn State class of 1977, and CEO of iGenCo, LLC, a health and human development company that provides experiential workforce development to management teams. While the top teams were recognized at the event and will be celebrated at a special reception during Penn State Startup Week next spring, each student took away experiences in teamwork and communication with others outside their major. The mHealth Challenge is coordinated by Costello, Cutezo, Ericksonand Gyekis; along with Lee Carpenter, pre-award and proposal development coordinator, and Meg Small, social innovation director, both at the Edna Bennett Pierce Prevention Research Center. Funding and resources in support of the challenge are provided by leadership in the three participating colleges, Happy Valley LaunchBox, and Global Entrepreneurship Week Penn State.